Well, last night was muy interesante. 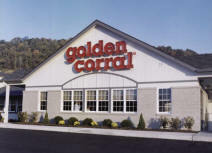 It was Renn's work party at none other than the Golden Corral. Imagine sending a queasy person to a purgatory designed specifically to torture - it was quite a challenge for my stamina. I did find some sugar free jello, cottage cheese, and pears that I could eat. Renn better know how much I love him! But other than they gymnasts in my stomach, it was unexpectedly pleasant. We got to sit at the grown-up table (as opposed to the oppressively obnoxious teenagers who need attention and validation table) and everyone got on quite well. Renn's boss said a few very nice words that were probably lost on a lot of people there, but not on Renn, and a good time was had by all (minus my stomach). I made the mistake of having a Diet Coke with my meal. It did a fantastic job of soothing said tummy, but the side effect was my being up until nearly 2 in the morning packing and wrapping Christmas Presents and doing laundry. I do not handle caffeine like I used to. Tonight I'm having a department dinner at a Japanese Steakhouse. Supposedly it's fantastic food, but I'm wondering when my body is going to reach it's limit. Hopefully I'll have all good things to report. Oh you poor thing! Any buffet restaurant is a nightmare when you're fighting barfing- I can't imagine much worse than the Golden Corral- but it soundslike you did better than I would have. Lets hope your sickness ends with the beginning of the 2nd trimester. Good Luck! PS while nothing works all the time, sugary things do help, as you found with the diet coke, and slurpee's from the convenience store are a real blessing when you are having a rough day...just FYI, from a very experienced barfer. Yeah for tips! I'm pretty nearly to the point where anything I am capable of keeping inside of me is chuck full of nutritional value. Unfortunately the less I eat the worse I feel, but the last thing I feel like doing (ever) is eating. Whose idea was this anyway?